WASHINGTON, DC / ACCESSWIRE / December 18, 2017 / America's Warrior Partnership, University of Alabama researchers and the Bristol-Myers Squibb Foundation have partnered on a four-year research study that will examine the factors and potential causes involved in suicides and early mortality due to self-harm among military veterans. Funded by a $2.9 million grant from Bristol-Myers Squibb Foundation, as well as additional investment from America's Warrior Partnership and other in-kind supporters, "Operation Deep Dive" will use unique methodologies that have never before been applied to the research of veteran suicides. The goals of the research study are to identify the risk factors that lead to suicide within veteran communities and help guide the development of programs to prevent and reduce self-harm among veterans. "This research endeavor is the first time that community environments will be incorporated into the research process, giving us a whole new level of insight into potential factors of veteran suicides," said Jim Lorraine, President and CEO of America's Warrior Partnership and founder of the Community Integration model. "Studies to date have generalized the indicators of suicide without a focus on the role the community may play. Leveraging our organization's focus on veterans and the communities in which they live, work, and receive support services, combined with University of Alabama's exceptional research team and unique approach, gives us a broader yet more specific perspective on veteran suicide risk factors." Operation Deep Dive is innovative in that it will study veterans across the spectrum of service, gender, and lifespan. Conducted in two phases, the year-long Phase I will begin with a five-year retrospective investigation of the impact of less-than-honorable discharges on veteran suicides and suspected suicides, as well as the differences in suicide rates between those who received and did not receive support services from the U.S. Department of Veteran's Affairs (VA). "Previous research has focused primarily on individual-level risk factors, like prior suicide attempts, mood disorders, substance abuse and access to lethal means, but suicide is a complex phenomenon and those factors don't paint the whole picture," said Dr. David L. Albright, Hill Crest Foundation Endowed Chair in Mental Health and associate professor in the School of Social Work at The University of Alabama, and co-principal investigator of the study. Phase II will incorporate the findings from Phase I into a three-year study that will include input from medical examiners, mental health experts, veterans, and family members to conduct a "sociocultural autopsy" of all new or suspected suicides in America's Warrior Partnership's seven affiliate communities. This individualized data and a chronology of the veteran's last year will be analyzed using a geospacial technique to identify trends, patterns, and indicators of former service members who take their lives. This same deep dive will occur in other communities where Community Integration is not yet active to provide a comparison. The results will explore how community context and engagement with local veterans affect the prevention of suicides. "The Bristol-Myers Squibb Foundation is committed to helping veterans and reducing the suicide rate among all those who have served in our nation's armed forces," says John Damonti, president of the Bristol-Myers Squibb Foundation. "This project will take a unique approach to better understand what is happening at the community level and develop predictive modeling procedures to identify those at most immediate risk." Drs. Karl Hamner, director of the Office of Evaluation for the College of Education, and David L. Albright, Hill Crest Foundation Endowed Chair in Mental Health and associate professor in the School of Social Work, are the principal investigators for the University of Alabama on the study. Both Dr. Hamner and Dr. Albright are committee chairs for the Alabama Veterans Network (AlaVetNet), which connects Alabama veterans to resources and services. Alabama Gov. Kay Ivey recently signed Executive Order 712, which tasks the group in helping reduce and eliminate the opioid crisis as well as reducing the high veteran suicide rate. 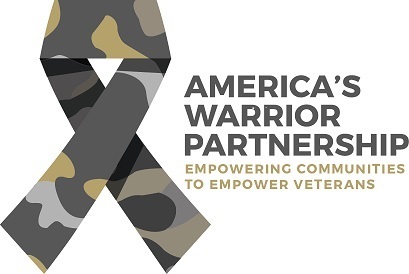 America's Warrior Partnership's Community Integration model is active in nine communities across the country and has served more than 37,000 veterans in three years. This model empowers communities through training, mentorship and structure to conduct proactive outreach to veterans by connecting existing resources and providing tools to create stronger collaboration among existing veteran service providers, bridging gaps in service wherever they may exist. The result is a more coordinated approach that holistically serves each veteran's individual needs, ensuring no one slips through the cracks or does not receive essential support services. America's Warrior Partnership is committed to empowering communities to empower veterans. We fill the gaps that exist between current veteran service organizations by helping nonprofits connect with the veterans, military members, and families in need: bolstering their efficacy, improving their results, and empowering their initiatives. America's Warrior Partnership is a force multiplier for warrior community integration that enhances communities where great Americans choose to live and contribute. For more information on the organization and how to get involved, visit www.AmericasWarriorPartnership.org. The Bristol-Myers Squibb Foundation is committed to improving the health outcomes of populations disproportionately affected by serious diseases by strengthening healthcare worker capacity, integrating medical care and community-based supportive services, and addressing unmet medical needs. The Foundation engages partners to develop, execute, evaluate, and promote innovative programs to help patients with lung cancer and removing barriers to accessing care in the United States, HIV, and comorbid diseases such as cervical and breast cancers and tuberculosis in sub-Saharan Africa, hepatitis B and C in China and India, and veterans' mental health and well-being in the U.S. For more information about Bristol-Myers Squibb Foundation, visit us at BMS.com/Foundation. The University of Alabama, the state's oldest and largest public institution of higher education, is a student-centered research university that draws the best and brightest to an academic community committed to providing a premier undergraduate and graduate education. UA is dedicated to achieving excellence in scholarship, collaboration, and intellectual engagement; providing public outreach and service to the state of Alabama and the nation; and nurturing a campus environment that fosters collegiality, respect, and inclusivity.